This is part of the 2015 Pre-Code Blogathon hosted by Danny at Pre-code.com and Karen at Shadows and Satin. Read more fantastic posts by clicking here. 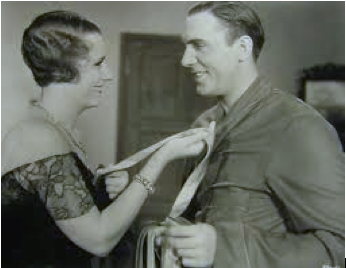 The acting is rough, the sound and lighting need work, but for anyone who has ever been thrown over for someone new, Consolation Marriage (1931) is just what the doctor ordered. The film has not one, but two thwarted lovers looking for someone with whom to drown their sorrows. Like Steve, Mary has been jilted by her amour. Aubrey (Lester Vail) is a struggling pianist who has decided to advance his career through marriage to a wealthy Mrs. (the film does not indicate if the woman is widowed or divorced). Mary is the stereotypical good sport. Without tears or fight, she allows Aubrey to profess his love to her though his bride-to-be waits in the car below. Instead, Mary chooses to say "good-bye with a smile." Later that evening, Steve introduces himself to Mary in a bar. There is some talk regarding whether or not the unchaperoned Mary is a "nice" girl (virgin/whore dichotomy surfacing), which in a roundabout way brings the characters to the realization that they are in the same boat love-wise. (She explains that she is without a chaperone because he [Aubrey] is getting married to another.) Mary comments that she is ready for her entitled good cry, and Steve offers to join her. Steve suggests that their marriage be one of no obligations. If it doesn't turn out, they simply leave with a "good-bye and good luck"--no questions asked. Mary likes the idea and agrees. They even liken marriage to a football game. No harm, no foul. An incredibly radical idea for the day, and I would venture to say that it still is. Despite the high divorce rate (or perhaps as evidenced by it because we are too quick to fall in the first place) in the USA, we tend to marry with the intent of staying married. The film wastes no time showing that Steve and Mary's marriage is indeed one of convenience and not flaming passion. Tokens of their ex-loves remain present in their home: Aubrey's wedding gift of a cupid clock and Elaine's hearts-and-flowers handkerchief. Even so, Steve and Mary's union produces a child, which means they were, ya know, doing it even though they weren't in love. This is another clear mark of pre-code movie making. Elaine comes back into the picture. In a note to Steve, she explains that her marriage has failed (surprise! ), and she is getting a divorce. Mary has caught on, and though she puts on a brave front, we can tell (via Irene's facial expression, no words necessary) she is worried about losing her husband. A similar note arrives from Aubrey, and Mary jumps at the "chance at happiness." As Mary prepares to leave Steve and their daughter, she reasons with the baby, explaining that "a baby is only an episode in a woman's life," and she would think her mother foolish if she gave up the chance for happiness because of traditional values. Suitcase in tow, Mary ends up at Aubrey's apartment. Up to now, Mary has touted a carefree attitude, and for beat, it looks as though the unconventional marriage will reign supreme. However, it doesn't take Mary long to realize that she has changed. Life does that. Aubrey and his tunes are no longer enough. "My baby needs me," she explains to her befuddled ex-beau, "Or I need my baby. I don't know which." Mary rushes home. She has forever closed the door on her past love, knowing full well that Steve may not do the same when he gets his turn. Mary doesn't have to wait long for this to happen. On Steve's invitation, Elaine shows up on her doorstep that evening. She stands poised and confident, the perfect homewrecker played by the woman who would later be typecasted as the perfect wife. Although Loy got her start in roles as the other woman, I'll admit it was kind of weird seeing the future Mrs. Charles swoop in to steal another character's husband. In true martyr fashion, Mary prepares Elaine for Steve, going so far as to powder Elaine's back and fix her hair. Elaine goes to Steve, and he takes her into the garden. While she talks of moonlight, Steve relates what he and Mary have been planning to do with the yard. To Elaine, love still exists in the abstract--the beauty of the night, the bursting of bubbles. Steve, on the other hand, has moved beyond their childhood poetry and into the concrete. Love is an action not an abstract noun. He excuses himself from Elaine and returns to Mary who has been crying in their daughter's room. In the end, Mary and Steve discover they have misplaced their romantic yearning and are in fact in love with each other. 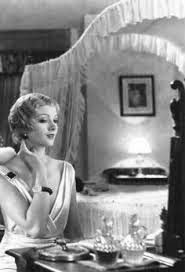 While the ending seems traditional, it is pre-code (im)morality that permits their enlightenment. The fruit is never forbidden, so each reaches awareness in their own time. Fortunately for them, they have similar timing. Magic of Hollywood. Not sure that would work in real life. Nonetheless...there is something I love about this movie. Maybe it's the friends to lovers formula. (I'm a sucker for When Harry Met Sally.) Or it could be the more mature viewpoint that true love is not always found in fireworks, but silently blossoms over time, in the everyday ordinary. Either way, Consolation Marriage has become a guilty pleasure. Currently Consolation Marriage is only available on VHS. I've seen this one in my Irene Dunne completist quest, and you're right, it is hard to get used to Loy as the other woman! Good one to cover! I was glad I caught the film when TCM showed it years ago. Irene is great. When she laughs, you can hear elements of future characters she would play. P.S. : It was great to meet you finally at TCMFF. If you had trouble with Loy as the other woman, wait til you see her in "The Mask of Fu Manchu"! 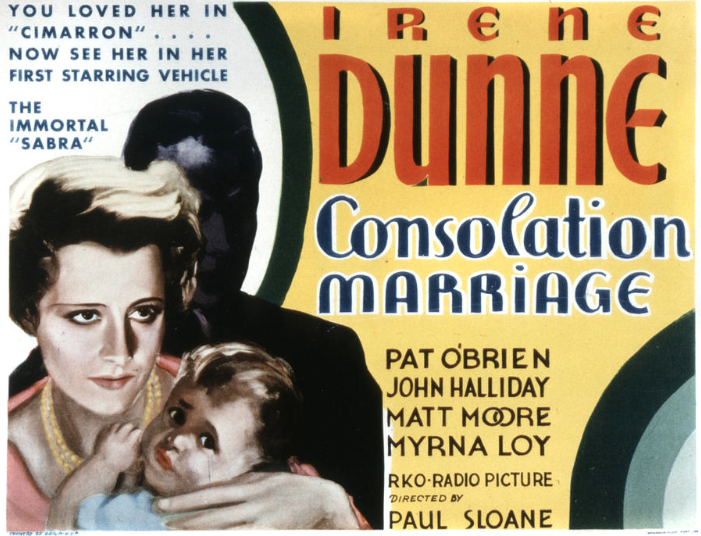 I have yet to see "Consolation Marriage", but with Dunne and O'Brien particular favourites, I'll certainly be on the look-out. I read about that one in her biography. I have a feeling it will be a surreal experience when I get around to watching it. ;-) Hard to believe the powers to be had her playing all those devious exotic women when she is clearly the perfect all American gal. Hindsight is 20/20, I guess. I really enjoyed your post -- I thought I'd seen this movie when I saw the title and the star, but after reading your write-up, I'm sure I haven't. I do think, though, that I have it in my collection, and you can bet I'll be scouring my shelves for it as soon as I finish these comments! Thanks so much for a great pick and a great contribution to the blogathon! Thank you for hosting the blogathon. The posts have been a kick. Hope you find the film--it is a treasure. I'll be first in line to purchase it if it ever comes out on DVD. Great cast in this film! Will be adding it to my Must Watch List. Thanks! It is definitely worth the watch. Thank you for stopping by! I can't believe I have never heard of a movie w/Dunne AND Loy. Thank you for introducing me to it.